Portable Edge Trimmer for edge banded tape applied to MDF and other substrate panels. works on PVC, ABS, paper and wood edge banding. The unit can easily be secured to any workbench table with the supplied clamps and is portable weighing only 42 pounds. The operation of the machine is easy where the board is fed through manually and in one operation, the horizontal and vertical edges are trimmed and scrapped. Flip the board over, repeat the process and you have a perfectly flushed-trimmed board. The Wurth Portable Edgebanding Trimmer is the perfect companion to Wurth's popular Edgebander. Manually feeding a banded panel through the unit will produce a horizontal cut, a vertical cut and a scraping procedure all in one step. Simply turn the board over, and the second pass will complete the finished edge. 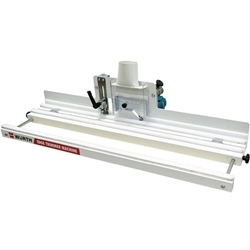 The benchtop Edge Banding Trimmer will work on PVC, ABS, paper and wood edge banding. At less than 42 pounds, the portability adds to the versatility of this must-have machine. With the adjustable fence, you can widen the stance from 6" to 16" and the table length is 39 inches long. This portable edgebander can easily be secured to any workbench table with the supplied clamps and is easy to install. The edgebander, powered router/trimmer is cradled in the swinging support and is gravity fed to the work surface, driving a 1/4" rounded bearing bit. The scraper block finalizes the cut with a slightly rounded contour to ensure a professional, smooth finish to all your woodworking and finishing projects. The edgebanding cutting area includes a transparent polycarbonate cover, which serves as a safety device while also forming a convenient dust extraction point that can be connected to all popular vacuum systems to help keep your workstation clean and safe. The cover is fully adjustable and securely held by two rare-earth magnets, allowing a workpiece thickness up to 2-3/8 inches. Table Width: 6" to 16"